Study Extracts D, E and F, and then answer all parts of part 2 which follow. Extract E: Arts and culture: making life better? Between 2011 and 2015, ACE allocated £1.4 billion of taxpayers’ money, and an estimated £1 billion from the National Lottery, to a range of activities and events, such as those provided by museums, theatres, and music festivals. It can be argued that the social benefits of these activities outweigh the private benefits and, in addition, it is stated that for every £1 invested in arts and culture, up to £6 is generated elsewhere in the economy. Education also has a role to play in enriching people’s lives. Schools provide countless opportunities for children and young adults to experience a variety of cultural and sporting activities. In some towns, local councils have provided licences to enable small businesses, such as bars and cafes, to host ‘live’ entertainment events, with other firms providing sponsorship for the shows. This allows for a more market-based approach. The performers enjoy performing, the firms generate income from the spectating public and the public have a great time. Everybody wins! One aspect of arts and culture that has seen growing popularity in recent years is music festivals. Faced with falling incomes due to changes in the way consumers obtain music, artists have been forced to tour and perform live more often. Whilst on the one hand new artists have benefited from the removal of barriers to entry, such as the need for a recording contract, once in the industry it has become more difficult to achieve the ‘superstar’ lifestyle. This is of course to the benefit of the many thousands of festival-goers who are able to enjoy a selection of their favourite bands for the price of a single festival ticket. It would cost fans much more to see these artists in separate concerts. However, there are concerns that, with ticket prices rising year on year, some fans are being priced out of the market. The price of a ticket to attend one of the most well-known festivals in the UK increased by 130% between 2000 and 2013. A much smaller music festival, held in the north of England, has also seen ticket prices rise, but not as significantly, as it has moved to a larger site. Between 2010 and 2014, the ticket price for the northern festival rose from £85 to £119, during which time the number of tickets on sale increased from 8000 to 14000. Here too, the benefits provided by Arts Council England have been seen, as it has contributed money towards the construction of a new stage. Q.5. Define the term ‘social benefits’ (Extract E). Answer: Social benefit is total benefit to society from producing or consuming goods and services. This includes the private benefits of the individuals and the external benefits generated from those actions. For the welfare of the society as whole, it is believed that social benefit should be greater than the private benefit. Q.6. 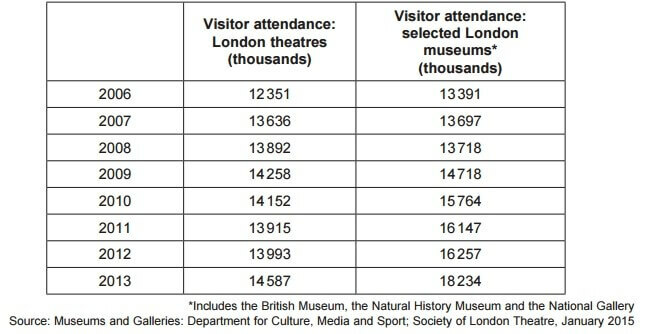 Using Extract D, identify two significant points of comparison between the visitor attendance figures for London theatres and selected London museums over the period shown. Answer: Over the years from 2006 to 2009, there has been an increasing trend in the number of visitors for both London theatres and selected London museums. But, the year that made a difference was 2010. In this year, the visitors’ attendance decreased for London theatres but at the same time, it increased for the London museums. This year, museums were more popular than theatres unlike the previous years. Also, this trend continued for the upcoming year 2011 too. Visitors’ attendance for London museums were growing at a faster rate and the fall in visitors’ attendance for London theatres was sharper in this year. London theatres tried to recover but it was not impactful. The growth rate of visitors’ attendance from 2006 to 2013 for London theatres was around 17.8% whereas the growth rate for London museums was 36% which is almost double. All other things being equal, calculate the price elasticity of supply of tickets for the music festival held in the north of England between 2010 and 2014 to one decimal place and explain the factors that might determine the price elasticity of supply of tickets for this music festival. Answer: Price elasticity of supply is the responsiveness of supply of goods with respect to change in prices. It is calculated as the percentage change in quantity supplied by the percentage change in price. The positive sign reveal that higher prices will be an incentive to supply more. PES is elastic and the firm is responsive to changes in price. This will give it a competitive advantage over its rivals. Firstly, the demand for the music festival. If people want the music festival and it is popular, then PES will be high because people would be ready to pay high for hear their favorite singers and musicians. Cost of Attracting Resources: If supply is to be increased it is necessary to attract resources from other industries i.e. sponsors etc. Q.8. Extract E states that Arts Council England is an organisation that ‘champions, develops and invests in artistic and cultural experiences that enrich people’s lives’. Using the data and your knowledge of economics, evaluate the view that providing subsidies is the best way to ensure that sufficient resources are devoted to the arts and cultural activities. Answer: The arts are an important policy asset and prosperity generator for states and society as a whole too. Arts and cultural activities are not given due credit and importance and therefore, sufficient resources are not devoted. Through subsidies only, these resources can be efficiently used and generate optimum welfare. This can be done best through subsidies only because private sector does not want to invest here due to lack of incentive. Therefore, the state needs to act accordingly. Both public and private funds are required for the promotion of arts and cultural activities. Government investment performs in the public interest and ensures that all areas of a state receive the benefits of the arts. Government provides fair access to arts resources, accurately assesses the state’s cultural needs and assets, provides accountability and reduces barriers to public participation in the arts. Arts and cultural activities are essential because they are known as economic drivers i.e. it creates jobs and produce tax revenue. Arts sector also acts as an economic asset because it accelerates production, generates tourism revenue, improves work force quality and alleviates property values. The arts have revitalized rural areas, cities and people dealing with poverty successfully and achieved a sustainable path. The arts promote thoughts and facilitate student’s achievement in school. It provides the critical thinking, communications and innovation skills essential to a productive 21st-century work force. The arts also support a strong democracy, engaging citizens in civic discourse, dramatizing important issues and encouraging collective problem solving. The arts safeguard distinctive culture and heritage which will be passed on to its future generations. All these functions need resources which can be devoted to this sector through subsidies only.